First of all, isn’t this just fun to say? This is a popular North African and Middle Eastern concoction with huge flavor. Not surprisingly, people unfamiliar with this, still love it. It’s versatile, quick to prepare, soul-warming and delicious. I love this for brunch. Feel free to double the recipe, divide it between two oven-proof dishes and you can feed a crowd for brunch. You can make the tomato/pepper mixture ahead, reheat it, then add the eggs and go from there. For brunch, I serve this with a leafy salad, that has citrus in it and a sweet-tart vinaigrette. I particularly like to use oranges and grapefruit, with some dried cranberries and some toasted nuts. If serving this for brunch, serve with the Wrap-Around Apple Pielets. Remember those? For a quick dinner, this is perfect. You can have this on the table in under 25 minutes. This is nice over some pasta, or on toast as you see it here. It’s a very flexible dish and the flavor combinations seems to have mass appeal. It’s a win-win. Heat oil in a large skillet (I use cast iron) over medium-low heat. Add the cumin seeds and let cook for about 30 seconds or until they begin to change color and you can smell their aroma. Add the olive oil, onion and bell pepper. Cook gently until very soft, about 10 minutes. Add garlic and cook until tender, 1 to 2 minutes. Sprinkle the paprika over and pour in tomatoes. 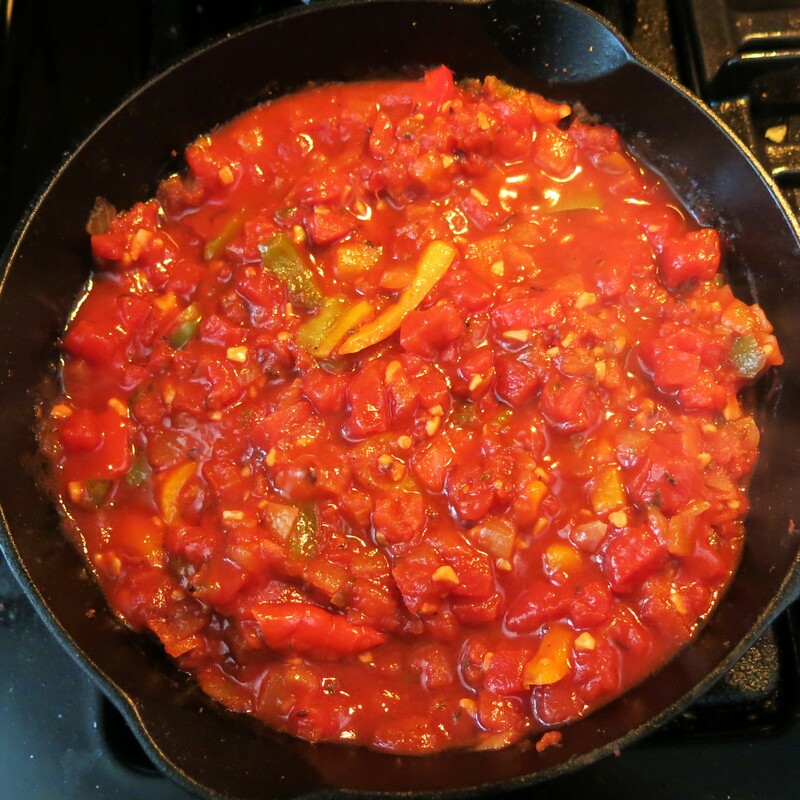 Season with salt and pepper; simmer until tomatoes begin to thicken slightly, about 5 minutes. Stir in the tomato paste and tomato juice; let simmer for 1-2 minutes (if using frozen tomato paste, push it down into the hot mixture, turn off the heat and let the mixture stand for a couple of minutes; then continue with the recipe). Give the tomatoes mixture a good stir. Make 6 shallow wells with the back of a soup spoon. Gently crack eggs into the wells. Transfer skillet to oven and bake until eggs are just set, 6 to 10 minutes (see NOTE). Sprinkle with cilantro and serve with hot sauce. NOTE: I usually finish this on top of the stove over low heat. After adding the eggs, I cover the skillet and it will take about 8-10 minutes for them to cook, but you need to use a small burner and very low heat. Remember, they will continue to cook after you remove the skillet from the oven/stove top, so slightly under-cook the eggs. You may add 1 cup crumbled feta cheese to the tomato mixture just before adding the eggs. If you use the diced tomatoes with zesty peppers, there is a decent amount of heat, but if you prefer, add fire-roasted diced tomatoes (with no chiles) and some pepper flakes of your liking…Aleppo are particularly nice with this. 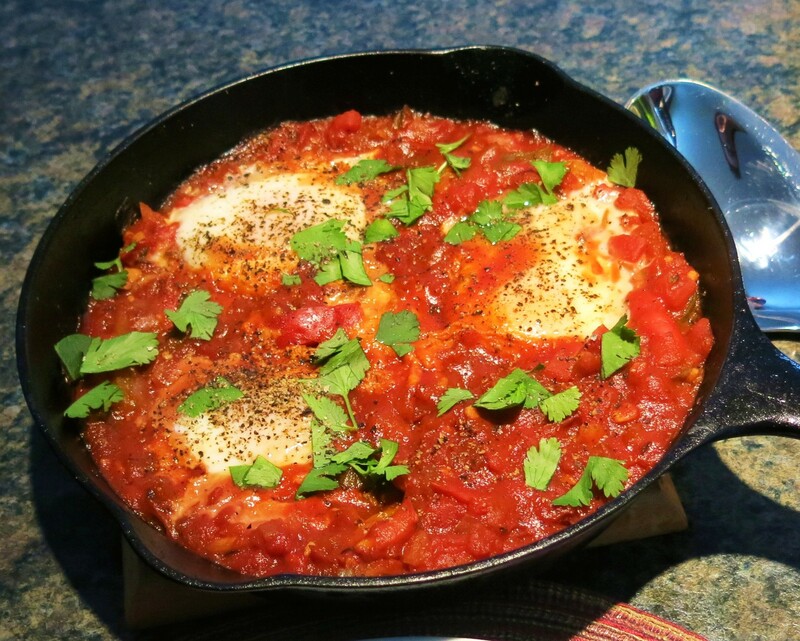 Shakshuka (Eggs with Tomatoes and Peppers) Recipe©Marcia Lahens 2015. All rights reserved. This can be on table in about 25 minutes, making it a perfect work-night meal. This is what the base will look like. Then you can take it from there. Feel free to add some chopped black olives and feta (see the NOTE in the recipe), if you wish. For a completely different dish, omit the cumin seeds and make the recipe as stated. But, at the very end, instead of cilantro, take a spoonfuls of pesto and drizzle the pesto over the eggs. 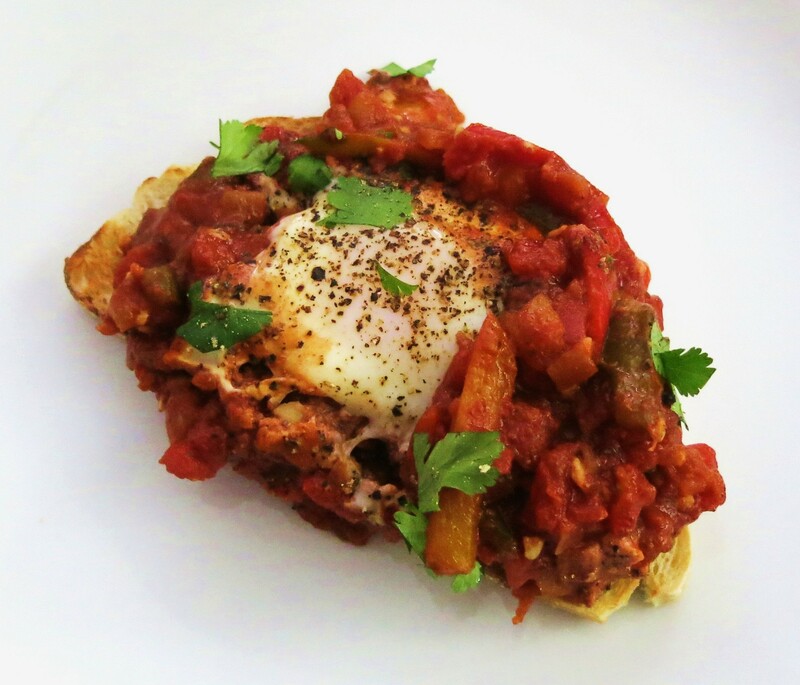 Another option, you can also coarsely dice or shred fresh mozzarella into the tomato mixture before adding the eggs. If you opt for the mozz, then it’s better baked it in the oven. This is a really delicious option, too; garnish with chopped, fresh basil…very nice for summer. I love, love, love cilantro, so I always serve some extra on the side, but you can omit it completely if you prefer. One last thing, if a firm yolk is preferred, then simply cook the eggs longer or for the 1 person that prefers the firm yolk, add that egg(s) to the pan 3-4 minutes before adding the remaining eggs. You just need to make certain you remember which one it is! Now, get some nice, fresh eggs and good bread and get started….